Auro: A Monster-Bumping Adventure is now officially available on the iOS app store. Dinofarm Games is proud to present Auro: A Monster-Bumping Adventure. The product of over four years of hard work, Auro delivers one of the deepest and most replayable and innovative games ever created, in a colorful, polished package. Auro is a turn-based tactical dungeon-crawler unlike any other. Instead of dealing damage with your attacks, your attacks “bump” them back a tile. Combining this with tons of crazy magical spells allows you to set up huge combos and come out victorious! 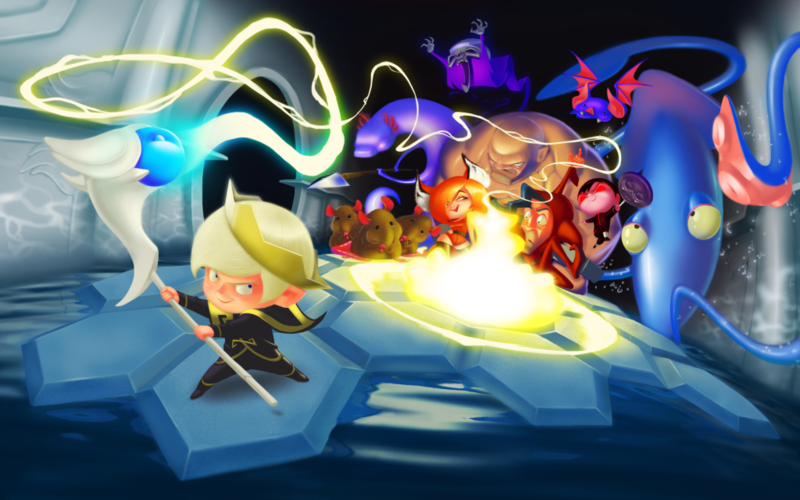 You play as Auro, the young spoiled prince of a magical Kingdom. After stealing the Royal Wizard Quillsh’s staff, Auro ran amok in the sewers, bumping everything he could see into the water and casting crazy magic spells. Soon, he found himself bumping an ancient statue of the evil villainous Prince Argo. This, of course, unleashed him onto the Kingdom. Now Auro must clean up his own mess and scare off that even-more-spoiled Argo! Auro was successfully Kickstarted in 2012. Thanks so much to our Kickstarters, our beta testers, our fans, and everyone on the team who was a part of making this thing happen. This is only the beginning! We already have another patch in the pipeline (1.27) which is currently waiting for review on iOS. As always, you can grab the game on Google Play as well by clicking here. Bought this as soon as I woke up this morning at 6am, and am about halfway through the tutorial. I am so happy for you that it’s finally out, and I am thrilled that this is meeting my exceedingly high expectations thus far. I’ll be telling everyone about Auro — thank you for all of your hard work and perseverance! If you get stuck in the 1.26 tutorial, 1.27 is coming soon (within hours) and makes it a lot easier. Also watch the tutorial video if you want. This inst’higs just the way to kick life into this debate. Bought (again)! I was a little harsh on you when I first bought the android version. But damn the design just… it’s so tight. Really congratulations on the release. I use my ipod much more than the android tablet so Auro is gonna get a lot more play time this time around. I really wish you’d do something about the victory screen. It really looks like a place-holder right now: White background, “victory” in a completely different resolution than the birdman and the text. Good point about the victory screen. We will improve it for sure. 1) I’ve played to a draw a couple of times now, where I’m backed into a corner, spells still charging, surrounded by water and monsters and barrels. I have to press restart in these cases. Perhaps the game could check for a state like this, so that players don’t try to figure out if there’s something they can do? 2) I sometimes lose/waste my first move on a new level, because it’s hard to tell if the level-victory-screen has registered my press, so that I accidentally press twice, thereby the second press becoming my first move in the new level. A sort of “Get ready!” pause screen before actually starting to play could be of use there. 3) The tutorial levels are MUUUUUCH better than the old story mode. I even learned a new trick (close-range air move that actually switches me and an enemy’s place). But I feel bad for you don’t have a use for the king sprite and Argo sprites anymore. Perhaps Argo could be added as a tough later enemy? Congratulations on the ios release I know it had some issues and had been delayed. The game is a blast to play. I am always amaze how timeless this game and 100 rogues feels to me. It seems to stick on my devices every time I take them off, they eventually end up back on. Its a sign of great game design when I feel like I have been playing 100 rogues off and on for years now. Looking forward to anything you do in the future. Glad this is finally out on iOS, and I’m enjoying it. But I find the minimalist approach to animation a little frustrating. It’s not always clearly that Auro has taken damage if I take my eye off the counter, and it’s sometimes unclear where damage (or death) is coming from. It would be nice if there were some attack animations or indications to make this more transparent. As for 100 Rogues, I feel like the monster classes (more specifically, their unusable item drops showing up in the main game) really screwed up the balance. I almost never play it now, which is sad; it was once my favorite game. Thank you so much for your purchase and we’re so glad you’re enjoying Auro. I am the animator, so I can speak to the animation. Honestly, I’d love nothing more than a fully animated cast of characters. Unfortunately, I’m only one man, and our company is very young. So, I devised a system in which I can make nice looking, big sprites with a relatively high framerate but…you know…get it done this century =]. So, i went with this slightly abstracted, pseudo-game piece direction. Try and think of the characters as animated chess pieces. In terms of other feedback, we’re improving that all the time and we agree it can always be sharper and more attention-getting when it comes to feedback for inputs. As to 100 Rogues, we agree! Without going into too much detail, Dinofarm only had control over the art and game design of 100 Rogues for the first year or so of its release. Another company published and coded the game. Many of the later decisions like the monster classes and other features did not go through Dinofarm and in fact we were very vocal about our objection to them. But it was out of our hands at that point. Long story. The good news is, Auro is 100% self-published and is the first true Dinofarm Game. Thanks again for playing and we hope you’ll follow us and join our forum! Oh well. I wonder whether there might be some easy solution for indicating attacks, one that wouldn’t break you on animation. Maybe tinting the sprites or their grid space on the following round, or highlighting sides of Auro’s grid space from which attacks were incoming, or picturing the enemy that killed you after death in the “Killed by …” window, etc.